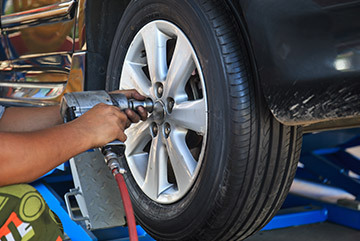 Appropriate tire rotation must be done every 3,000 - 6,000 miles or with every oil change. What it does: Rotating your tires is essential to ensuring your tires last longer. This means changing them from one side of the vehicle to the other, moving them from front to back or a combination of both, depending on your vehicle and what was done previously. Some tires need to be rotated at specific intervals, while others will have to be rotated depending on the wear. Why service is essential: Uneven tire wear may result in poor performance and bad fuel efficiency. It can also shorten the life of the tire and can cause safety issues. Energetic driving practices, stop and go urban area traffic, roadway construction, etc. To learn when your tires need to be rotated, consult your vehicle’s owner's manual or ask a Chabill’s Tire & Auto Service tire professional today. Contact us to arrange your next tire rotation in conjunction with your other vehicle maintenance needs.